Looking for a sofa bed deal? Your search ends here. Perhaps you're looking to update your current sofa bed as it's looking worn out, or you are sofa-bed newbie and need a place for your guests to lay their heads. Whatever the reason, this April we've got all of the best sofa beds at the best prices. Don't spend your time trawling the internet trying to find deals, just come to us for the best sofa beds including everything from retro ones to sofa beds with storage and even corner sofa beds. Wondering how to find the best sofa bed deal? Well, we've got plenty of budget sofa beds in our 2019 buyer's guides, but obviously you want to be sure you've got the best-priced sofa deal, right? Buying it here is your best option, as we update this page on a regular basis, giving you updates on the very best bargains. For more on sofa beds, from buyer's guides to the latest deals, check out our dedicated sofas page. Or you can browse all the latest bargains we've found on our dedicated deals page. Haven't found one which suits your home interior? No worries. We've got loads more sofa beds below. Is my new sofa bed the right one for me? How to choose a sofa bed? We know you're going to be pretty desperate to score that sofa bed deal of the century, but don't buy in a rush without making sure you're absolutely certain you've got the size right. Whether you want a small sofa bed to medium, large or even a corner version; consider how each will fit in your living room layout by using masking tape or newspapers to create cutouts on the floor. Always remember to allow for the footprint of the sofa bed when measuring, and note the measurements from the back of the sofa to the end of the sleeping area, not just the bed’s dimensions. Also, always check that the sofa bed can fit through your front/back door, as there's nothing worse than ordering the sofa of your dreams, to find it won't actually fit into your house. Another good idea would be to check the size of the mattress, too, rather than judging sleep space by whether the sofa’s a two or three-seater. A big sofa doesn't always equate to a large bed, and a double mattress might be the perfect fit for a single sleeper, but if you've got a couple staying, they may not get a good night's sleep. You’ll also need to decide between a fold-out or pull-out sofa bed. Fold-out sofas tend to have a larger sleeping area, but won't have a headboard, if you're thinking of getting one of these, you might also want to add a mattress protector beneath the bedding to soften the seating/mattress and to protect it from spills. Pull-out sofa beds are a more affordable option, and may be all you need for occasional guests. They usually have two or three-fold mattresses: those that fold into three being thinner and less supportive than ones that fold into two, which will most likely be deeper and more comfortable. Sofa beds come in both contemporary and traditional styles, so you won't have to compromise on it fitting with your decor. Long, low lines will create a modern vibe, while high-backed designs look more classic. 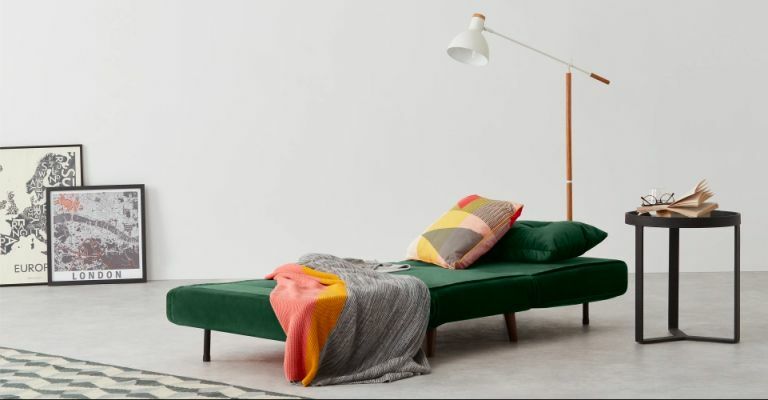 Forget style – what about the sofa bed's construction? Sofa beds are made with the same fillings as sofas. Choose foam for a firmer seat; fibre for softness with support; or opt for plump feathers for the softest sofa. Fillings may also be combined for a balance of features. It's also worth noting that a sofa bed will feel firmer than a standard sofa, so be sure to try in store or shop with an online company that allows returns to ensure you’re happy to take a seat as well as put up visitors. When it comes to the frame, just as with a sofa, look out for a hardwood frame that’s screwed as well as glued for long life. It's also a good idea to check the sofa bed's mattress for comfort. Some may be open or pocket sprung, or made from memory foam. Memory foam moulds to the body to create good support, but some people find it too warm. Pocket springs are more luxurious than open springs – and more costly – but they can help stop sleepers rolling together.